Goriely, S.; Garcia, D.; Bravo, E.; Jose, J. The p-process nucleosynthesis in He-accreting white dwarfs with sub-Chandrasekhar mass is revisited in the light of multi-dimensional hydrodynamical simulations. Post-processing calculations are performed on a sample of well-chosen track particles representative of the core and envelope material that is subject to the p-process. The p-abundance distributions in the disrupted core as well as in the ejected envelope are estimated and compared with previous analysis based on spherical-symmetric simulations. The present calculations confirm the results obtained in 1D simulations and the possibility to produce in particular the puzzling Mo and Ru p-isotopes in the envelope, provided it is initially enriched in s-process elements. Goriely, S. [et al.]. 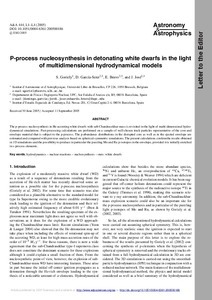 P-process nucleosynthesis in detonating white dwarfs in the light of multidimensional hydrodynamical models. "Astronomy and astrophysics", Desembre 2005, vol. 444, núm. 1, p. L1-L4.